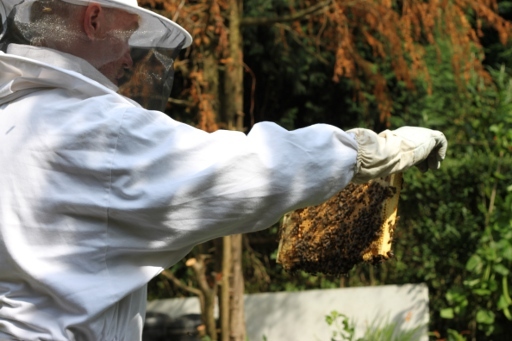 I helped Roger with his hive inspections this morning, opening up both hives and checking for progress. This involves looking at each frame and working out whether there are eggs, larvae, nectar, honey and so on. 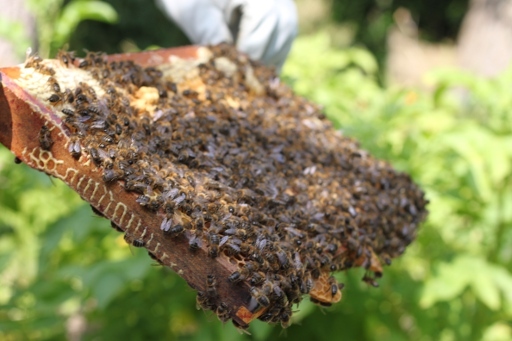 The comb makes wonderful patterns, and sometimes the bees produce protuberances at the bottom of the frames – they fill any tiny spaces with propolis, but larger spaces get filled with honeycomb and it’s not quite as regular a structure as you expect. Zooming in she’s fairly obvious! Once the hive is reconstructed the bees are still a bit angry, buzzing around the entrance. But they’ll be back to normal soon. Woa, beautiful photos! Just looked at them with Max. Why is the queen blue? Did Roger do it? And when will there be honey? How can you see with all those bees crowding the hive? The queen’s got a blue dot because 2010 is a blue year. No, seriously! 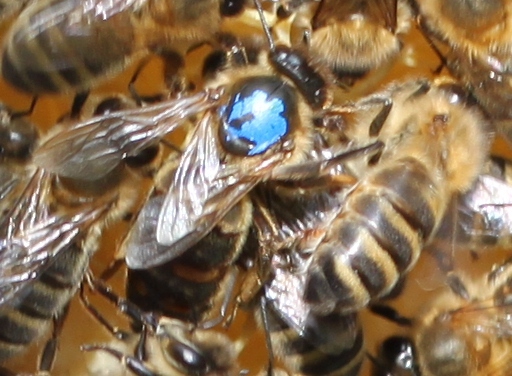 When you get a new queen you can catch her and mark her, and the UK beekeeping association recommends using a colour that identifies the queen’s age, and 2010 queens are blue. The spots sometimes fall off so it’s not a perfect system, but it does let you know roughly how old she is. Roger didn’t mark this one though, she came marked from the bee shop. 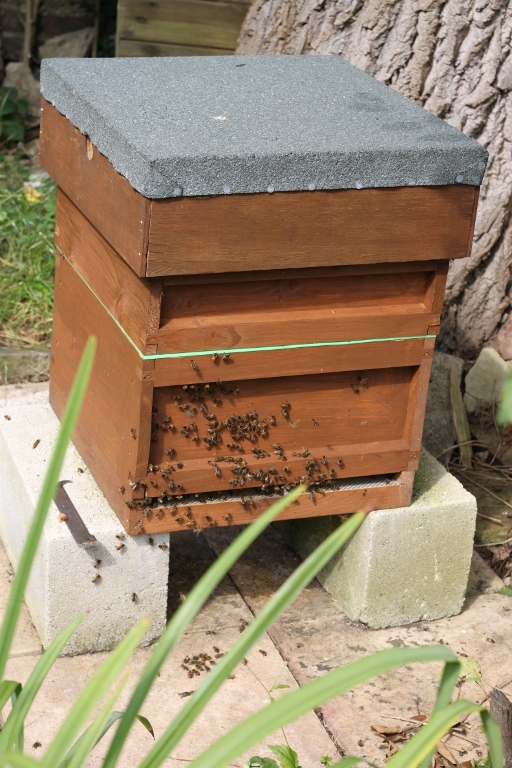 We hope to get some honey from one hive later this year. Hive #1 has a super on top (you can see it in the bottom photo, it kind of looks like a 2 storey hive), and between that and the hive is a queen-excluder so that part of the hive will only be filled with honey, not eggs. Once it’s full, or nearly, we’ll steal the honey. We did taste a teaspoon a few weeks ago though and it’s delicious. 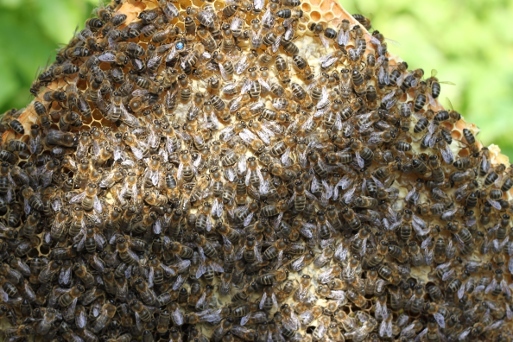 You can’t see clearly with all the bees in the way but you’re looking for fairly specific things: “brood” (eggs or larvae) look different to honey, and nectar and pollen are fairly easy to spot. The bees are in the way but you also have to realise that they’re constantly moving so you can see what’s underneath them pretty easily.